GYROMAX™ 929 is an orbital shaker with a 38-liter bath. Its 19.0"W x 12.5"D platform is larger than most in the marketplace and can accommodate fifteen 250-mL flasks. The platform assembly includes baffles for efficient water mixing. GYROMAX™ 939 and 939XL are reciprocating bath shakers. The shaking speed and shaking stroke are both adjustable. 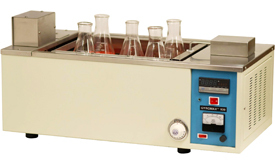 Model 939 has a 39-liter bath with a 15.7"W x 11.8"D platform. Model 939XL is larger, and features a 54-liter bath with a 24.4"W x 11.8"D platform for greater throughput. Each shaker incorporates a circulating pump to ensure optimum mixing and temperature uniformity. 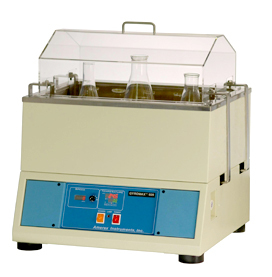 GYROMAX is a trademark of Amerex Instruments, Inc.
For water bath shaker accessories, click here.